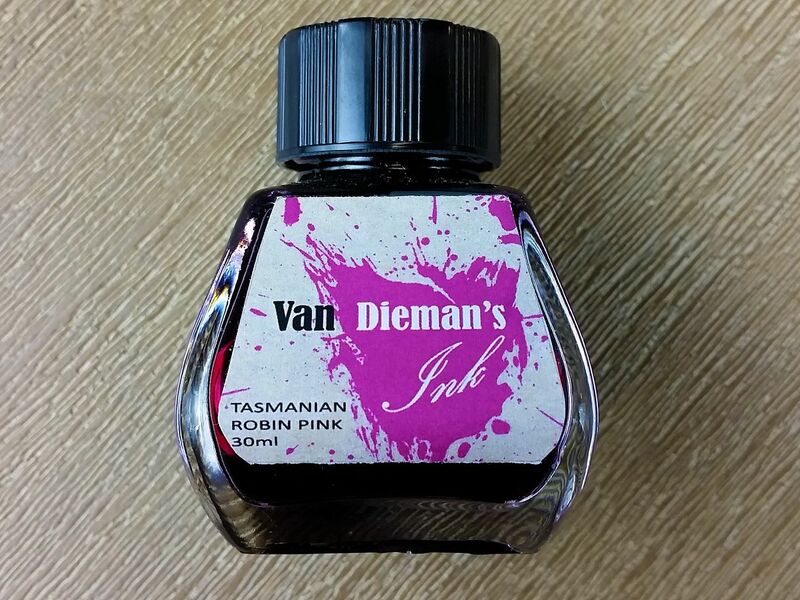 Van Dieman's Ink is an Australian company in Launceston Tasmania. 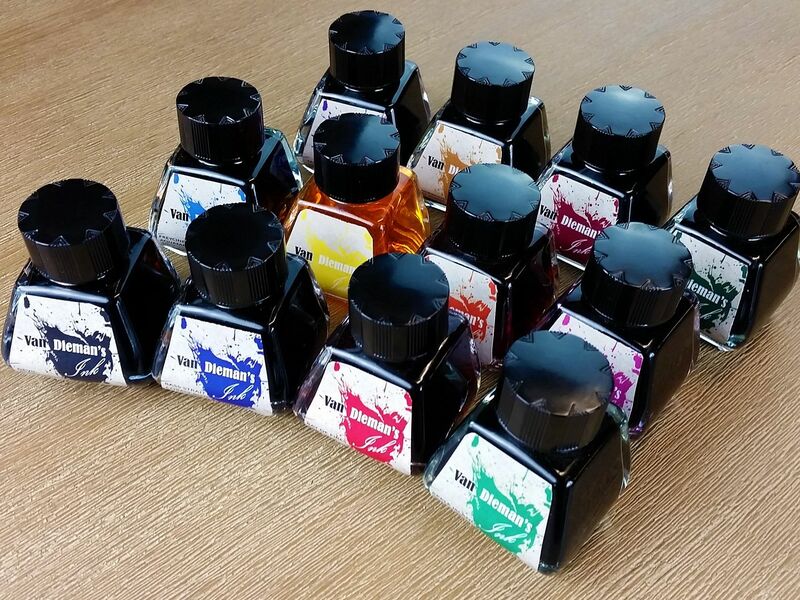 These high quality fountain pen inks have been tested for viscosity and flow quality and are suitable for all major brands of fountain pens, and are also suitable for dip pens and brushwork. 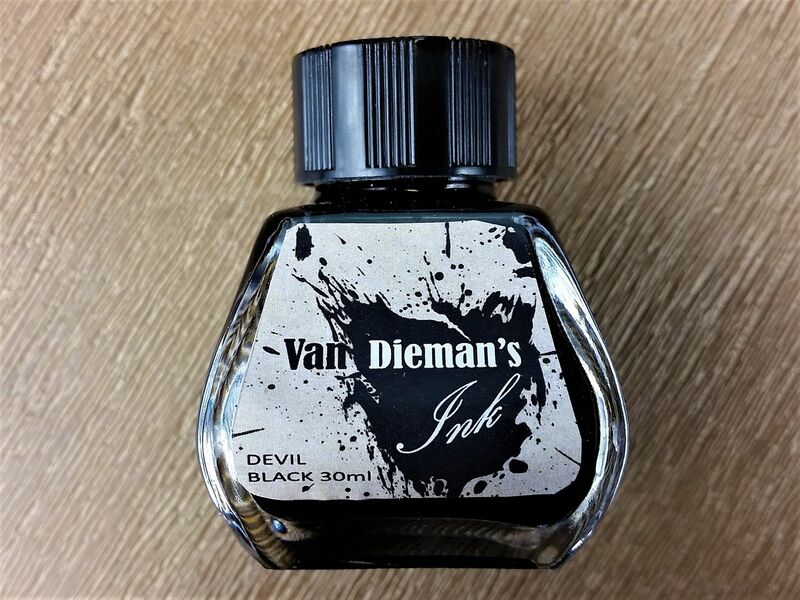 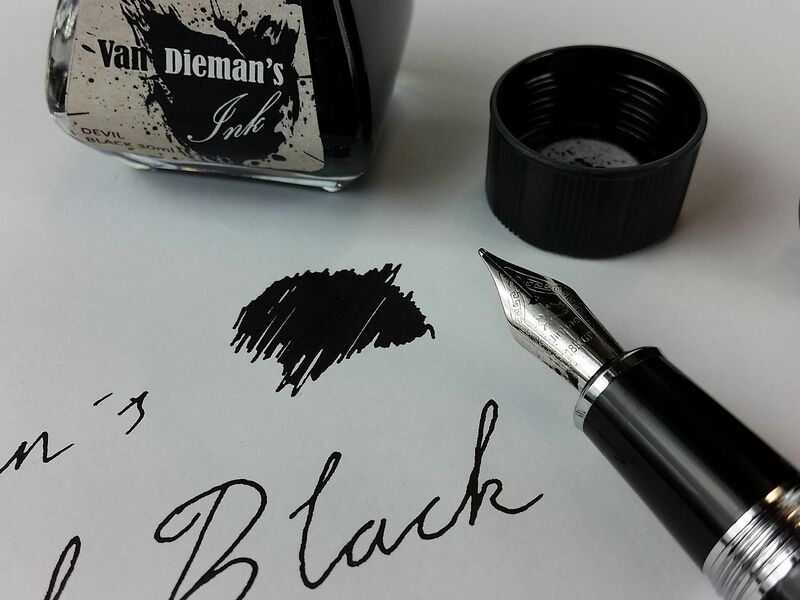 Unlike other major brands, Van Dieman's Inks are produced to lack the acrid or pungent smell often associated with fountain pen inks, while maintaining a high quality, smooth flow, light and age resistance and deep vivid colours. 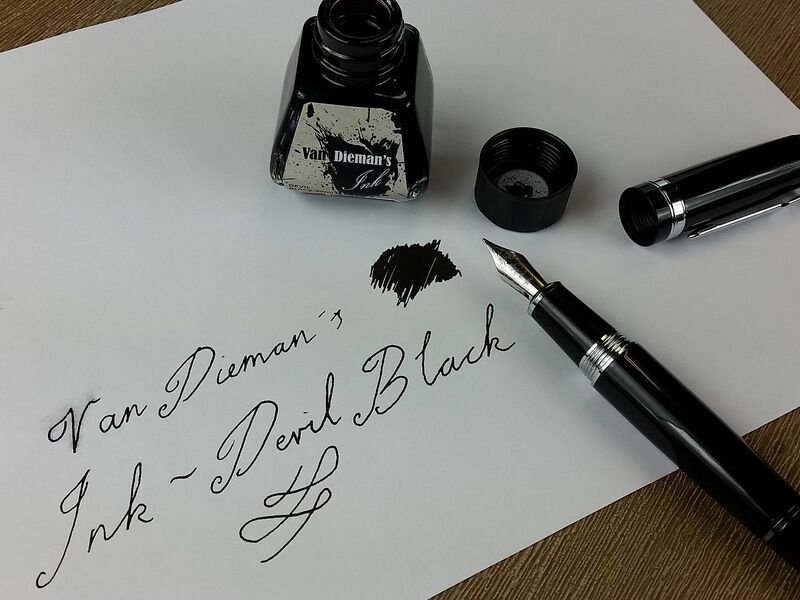 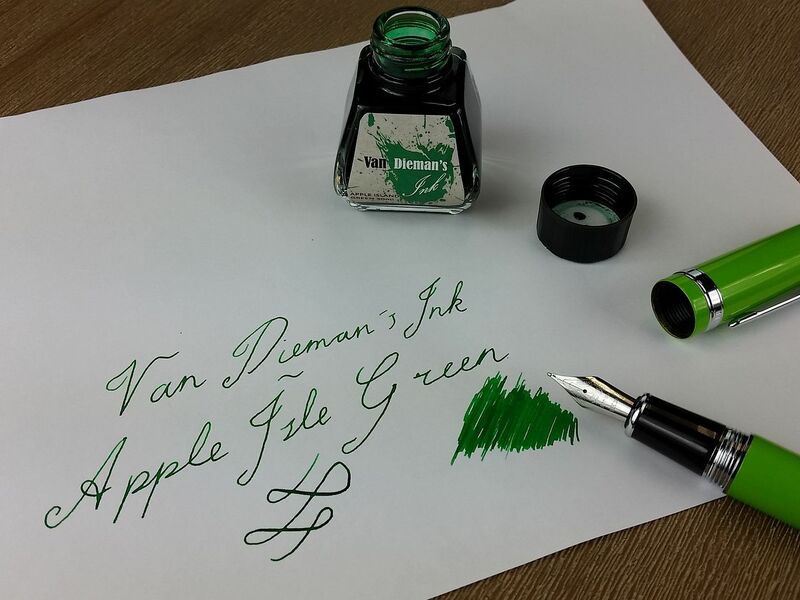 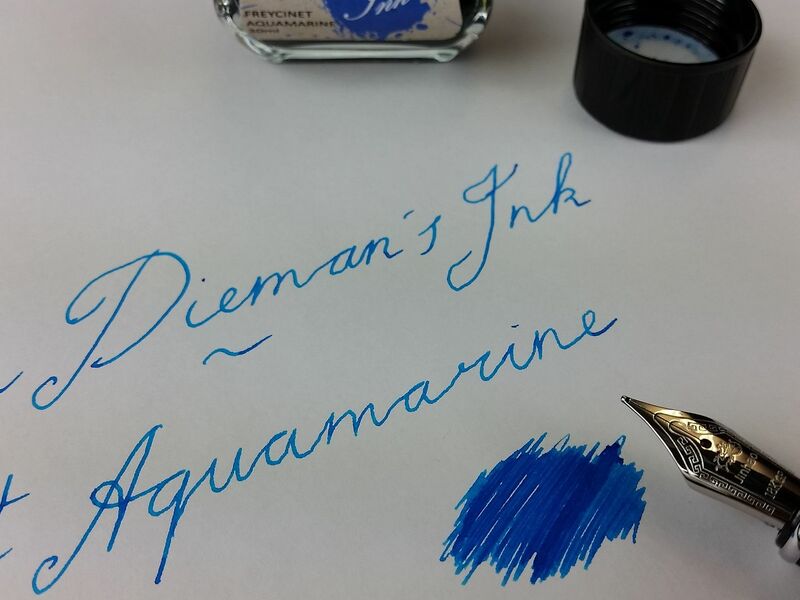 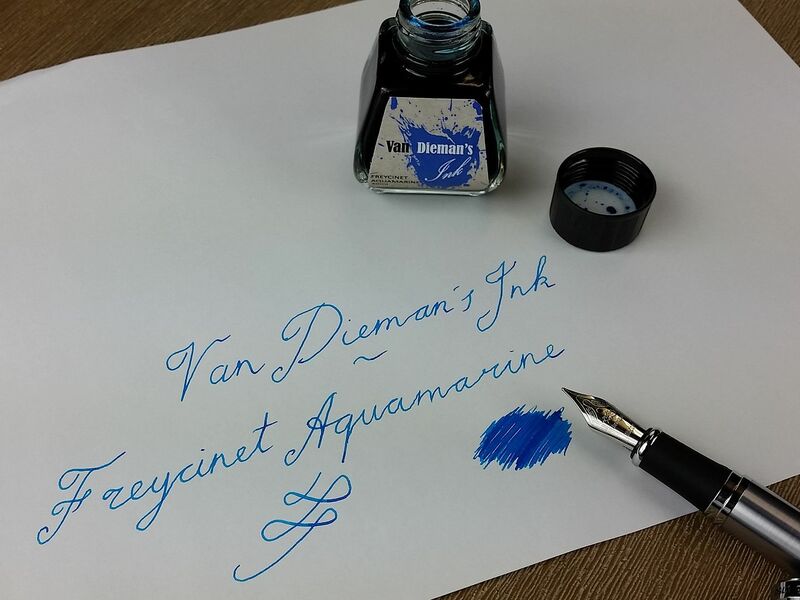 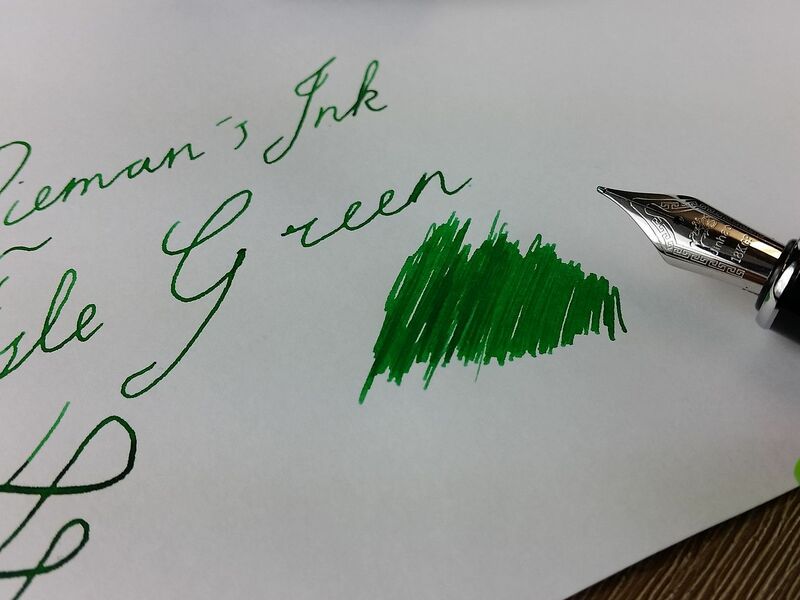 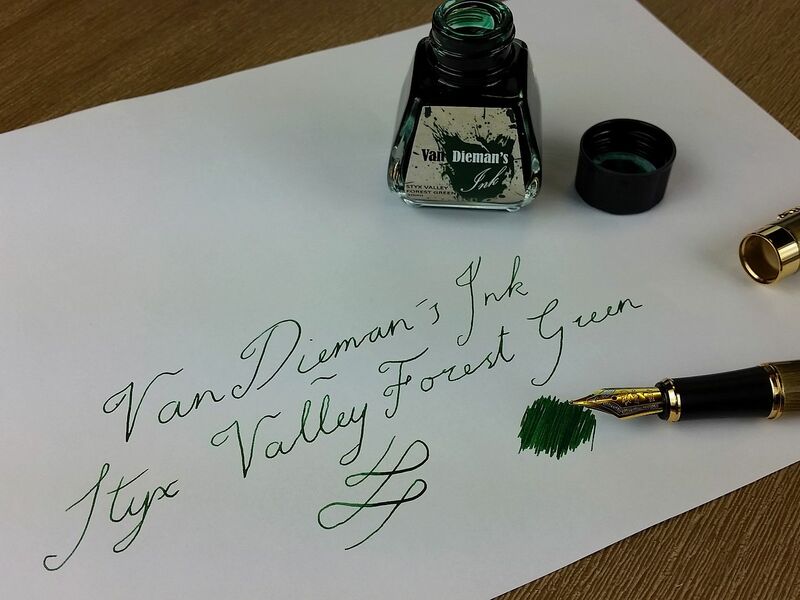 Van Dieman's Ink is an affiliate of JINHAO Pens Australia, which is also Australian owned and operated, and retails the high quality Fountain Pens produced by JINHAO. 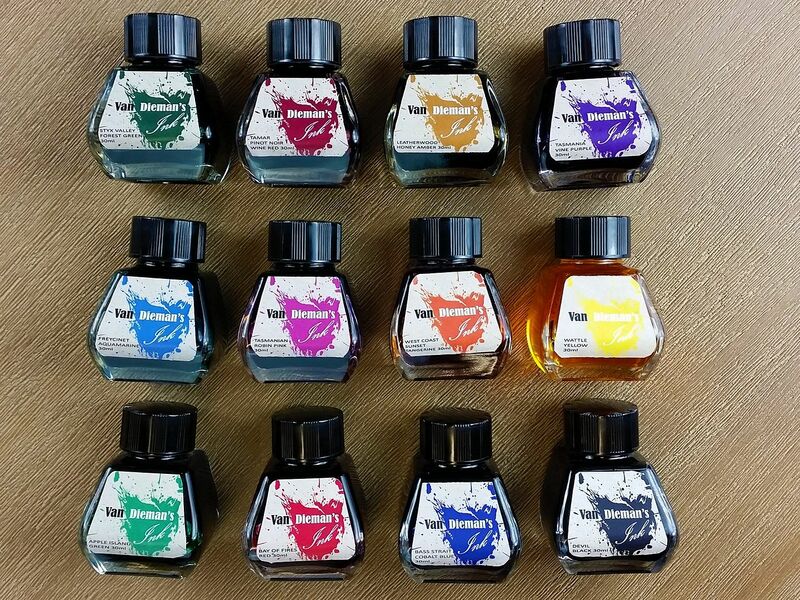 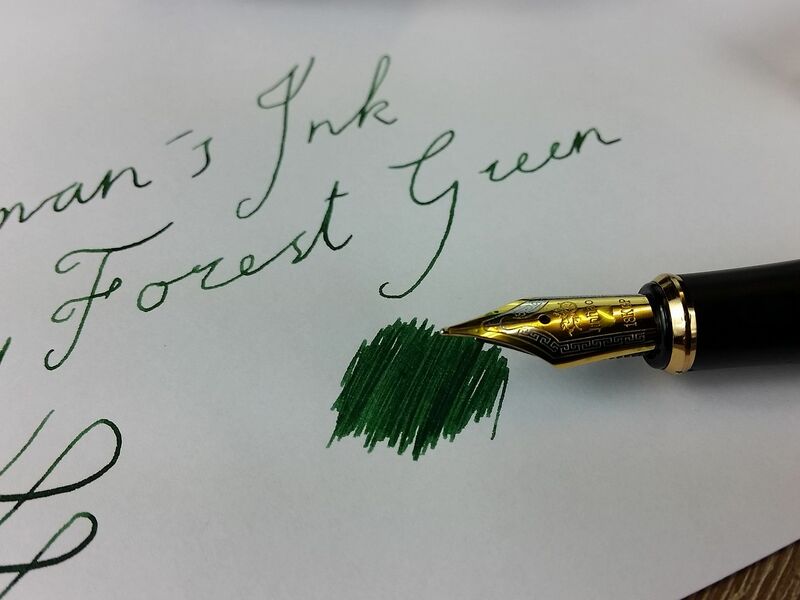 Our water based fountain pen inks are mixed utilizing a method that maximizes colour longevity, improves flow viscosity and generates a sumptuously enjoyable writing experience, but also avoids the unpleasant acrid smell that fountain pen ink is generally well known for. 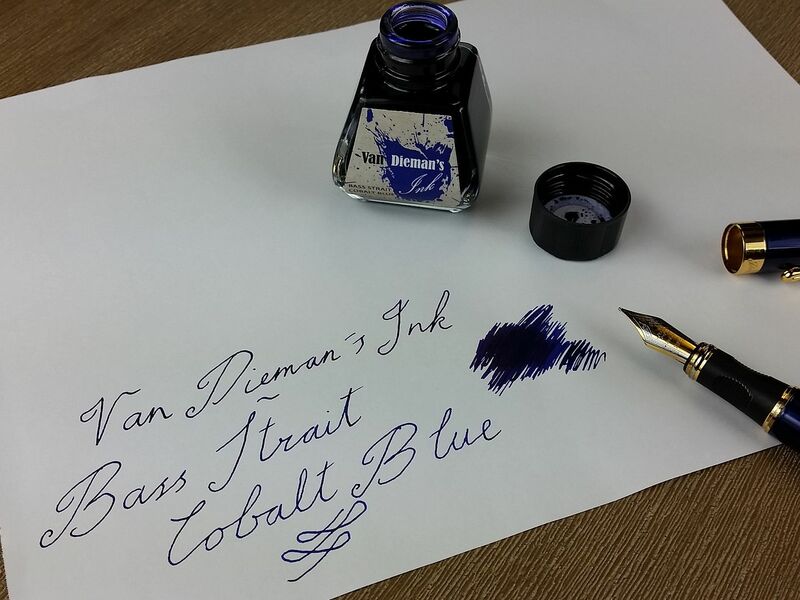 Van Dieman's Bass Strait Cobalt Blue is a deep and stormy ink, with much to say about the treacherous waves that separate the two islands of this southern land. 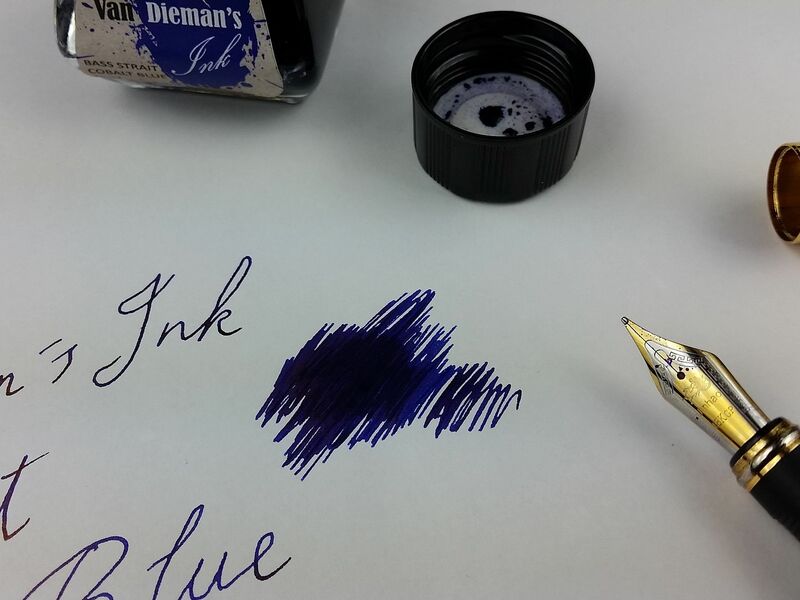 The Bass Strait, with a dark and tumultuous reputation, gives its hue to this ink, which is somewhat darker and deeper than most blues, with even a hint of indigo-violet. 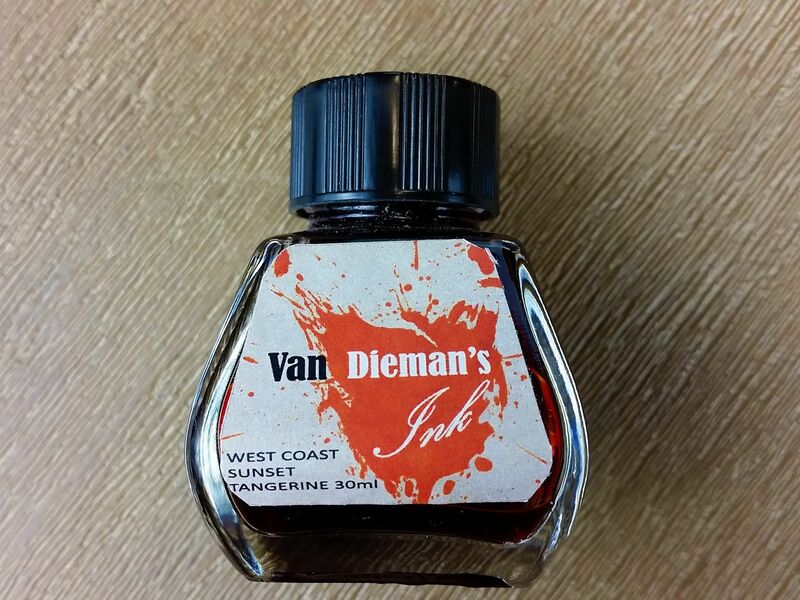 Guaranteed not to clog or clot, you will be very happy with this salty little bottle of turbulence. 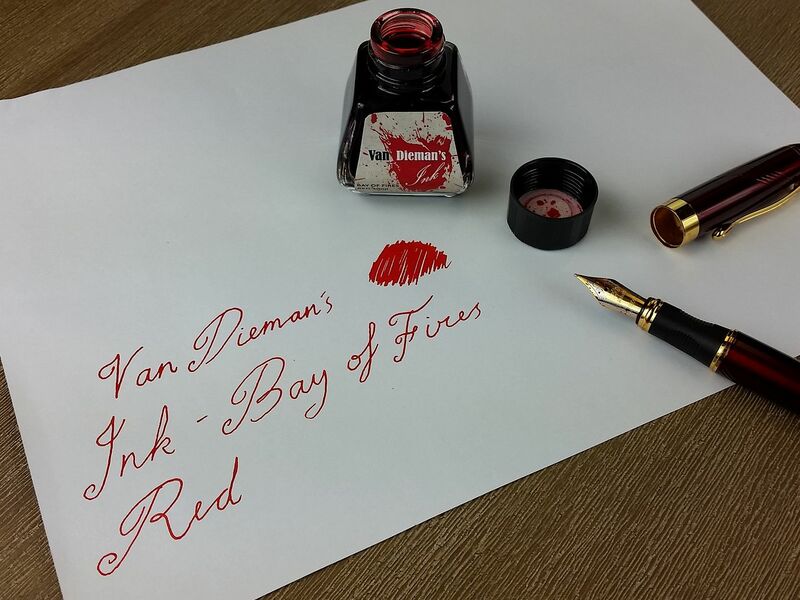 Van Dieman's Bay of Fires Red is a hot furnace of colour. 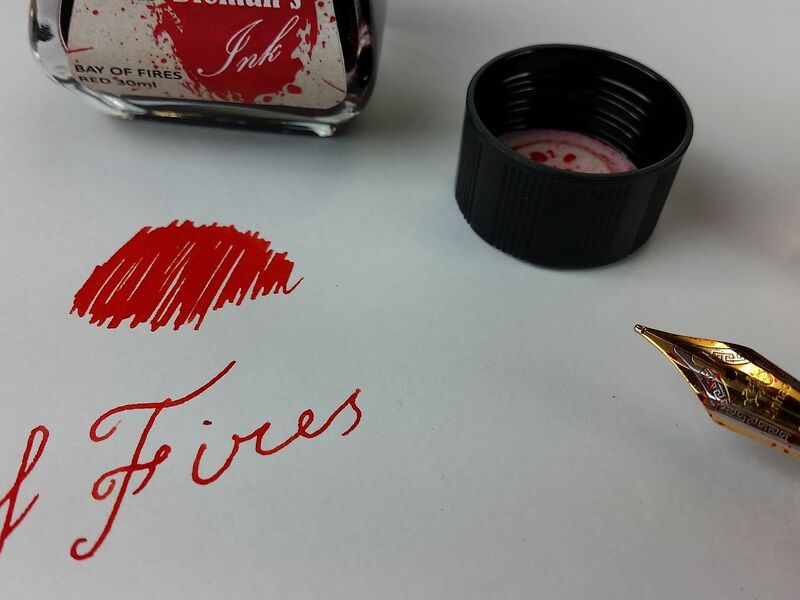 The Bay of Fires, in Tasmania's rugged north east, was named by Captain Tobias Furneaux, when he sailed the Adventure past in 1773 and noticed the great number of Aboriginal fires. 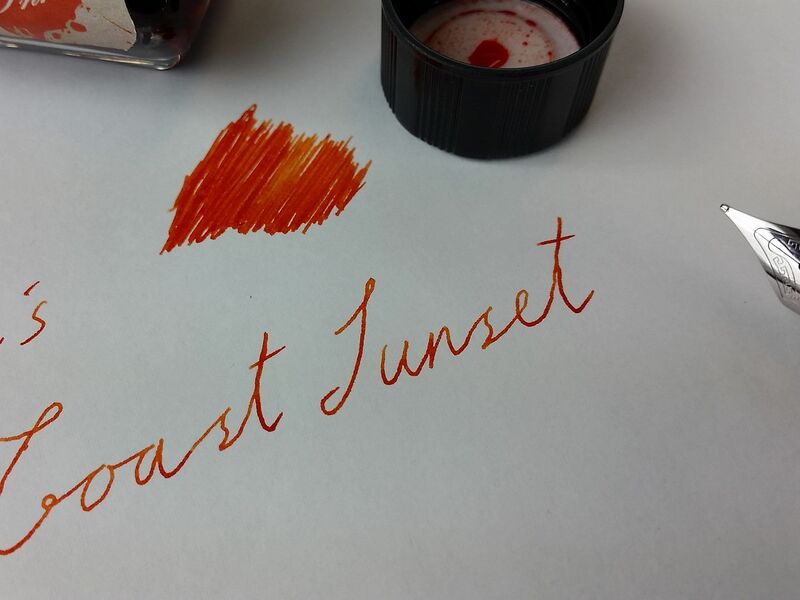 Today, the bay is best known for its Orange-Red stained granite stone which decorate the pristine white sandy beaches and illuminate red in the sunset light. 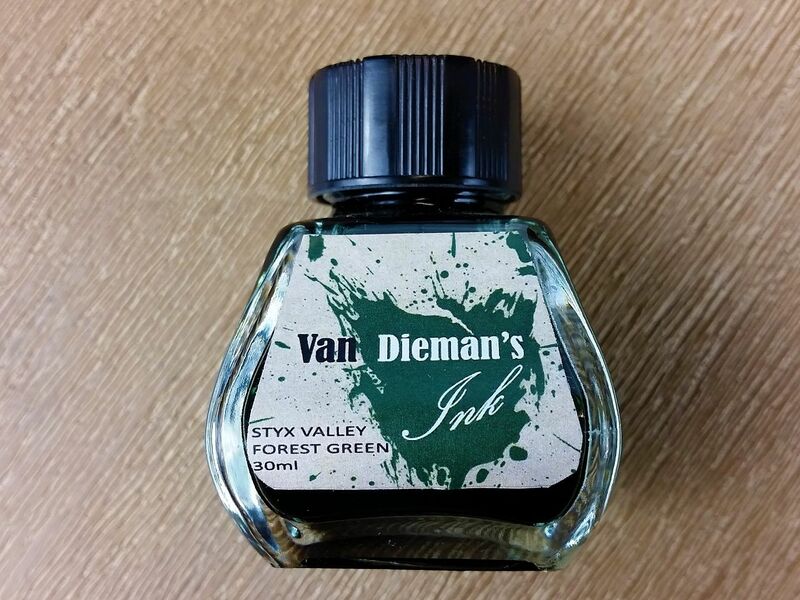 This ink, rather than imitating this colour, aims to encapsulate the adventurous spirit of Tasmania. 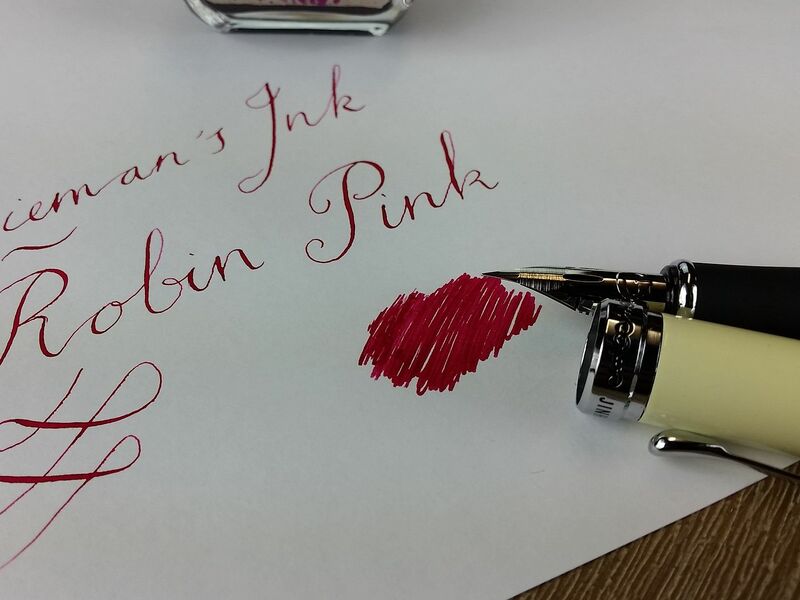 It is more vivid than the average red, with subtle hints of tangerine and magenta. 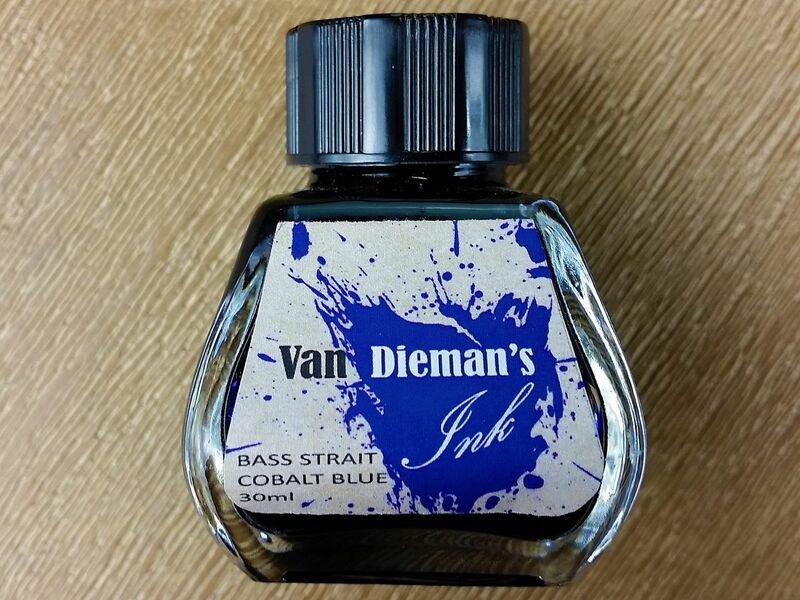 Guaranteed not to clog or clot, you will be very happy with this little bottle of adventure. 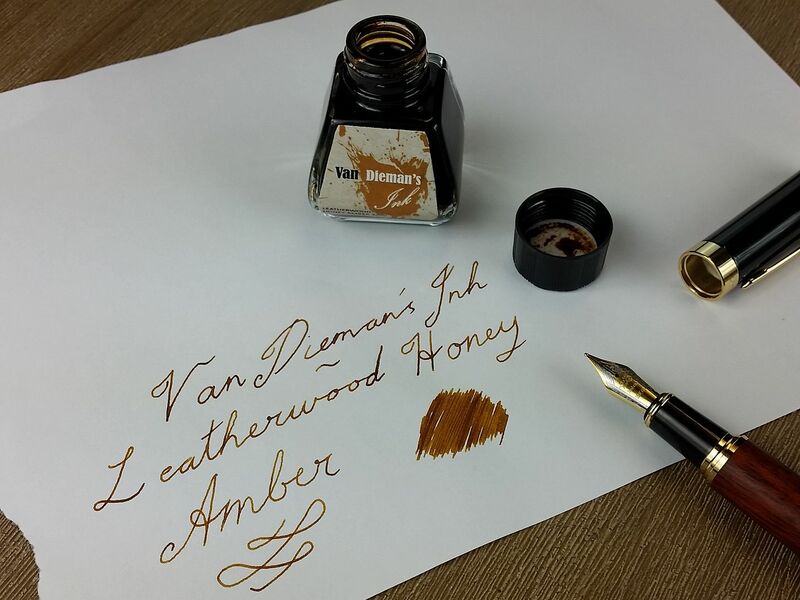 Van Dieman's Leatherwood Honey Amber takes its colour and name from, as any true Tasmanian Apiary will tell you, the best darn honey in the world. 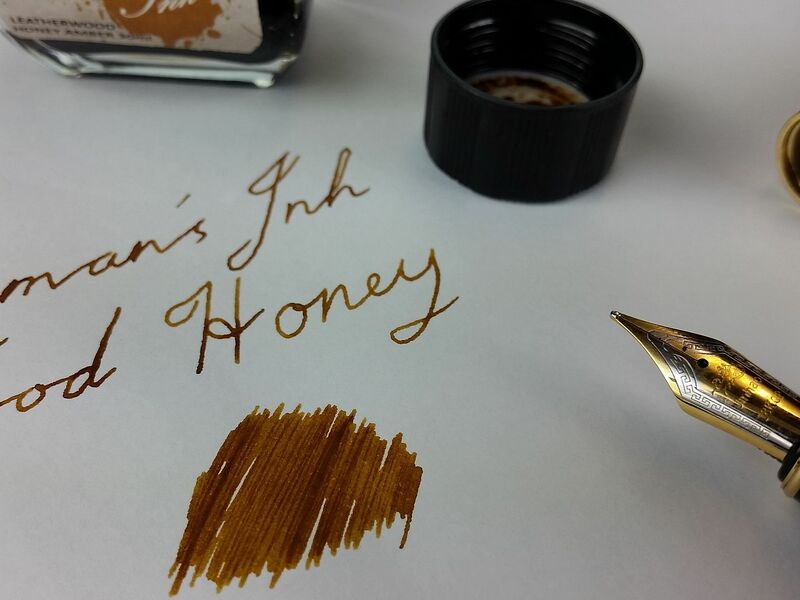 The blossoms of the leatherwood tree, which only grows in Tasmania, produce a honey rich in flavour and aroma, deep in colour and high in sticky viscosity. 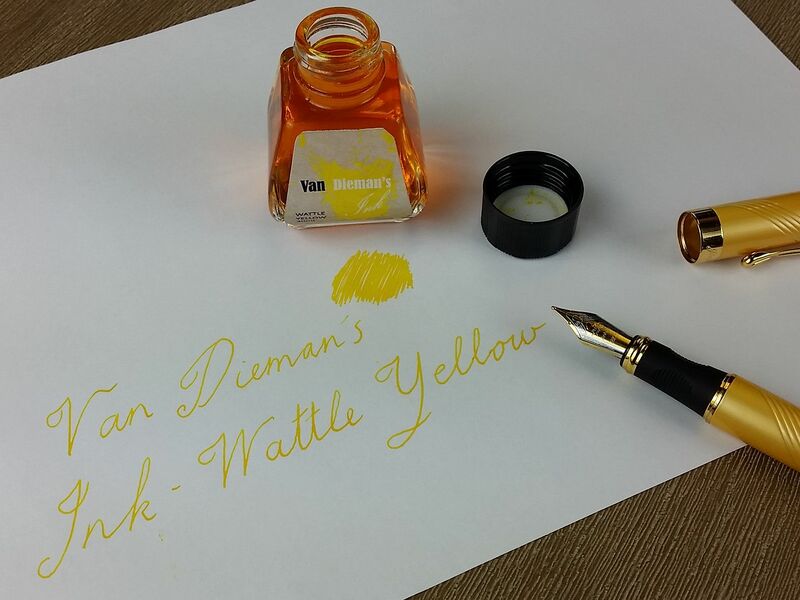 This ink's vibrant amber hue and smooth sumptuous writing feel match its namesake well. 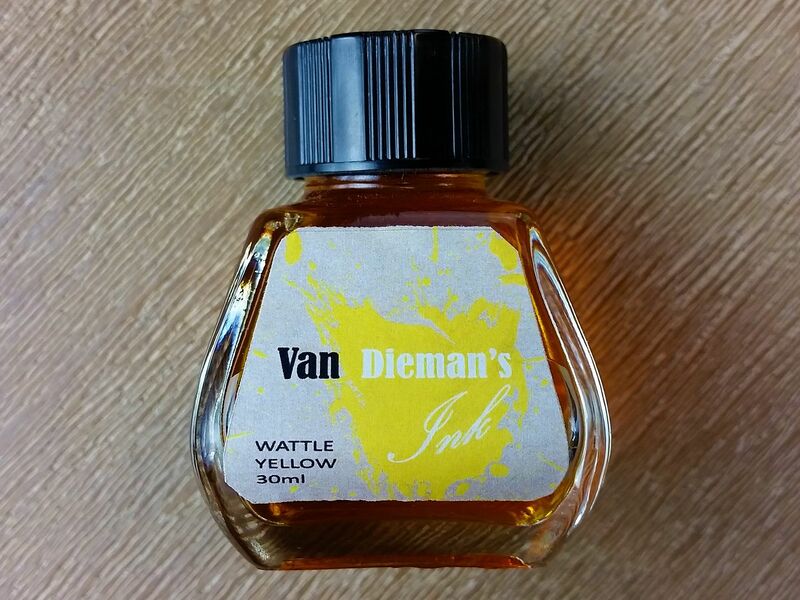 Guaranteed not to clog or clot, you will be very happy with this sweet little bottle of deliciousness. 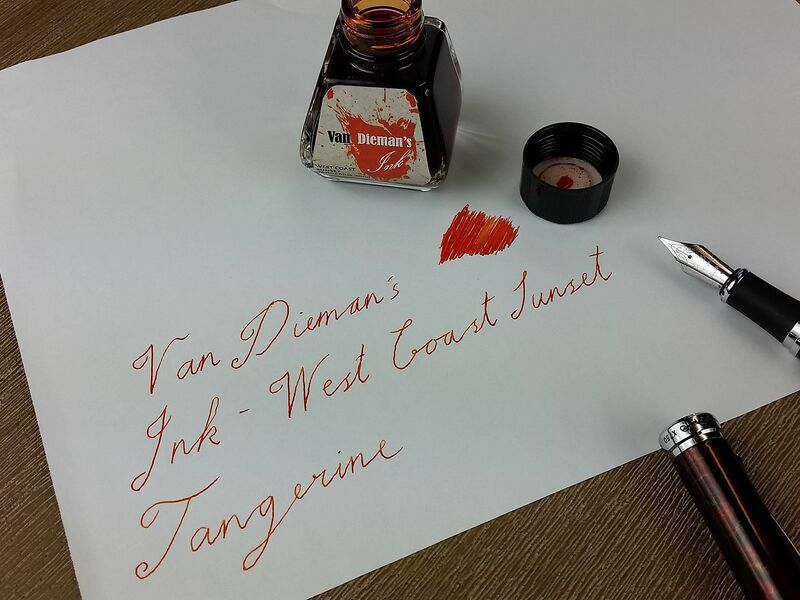 Van Dieman's West Coast Sunset Tangerine is a stunning and outstandingly vibrant orange, with plenty of inspiration from the vibrant and dazzling hues one witnesses in the furthest western regions of Tasmania, on those wild and woolly beaches, in the late, late evening of a south sea summer. 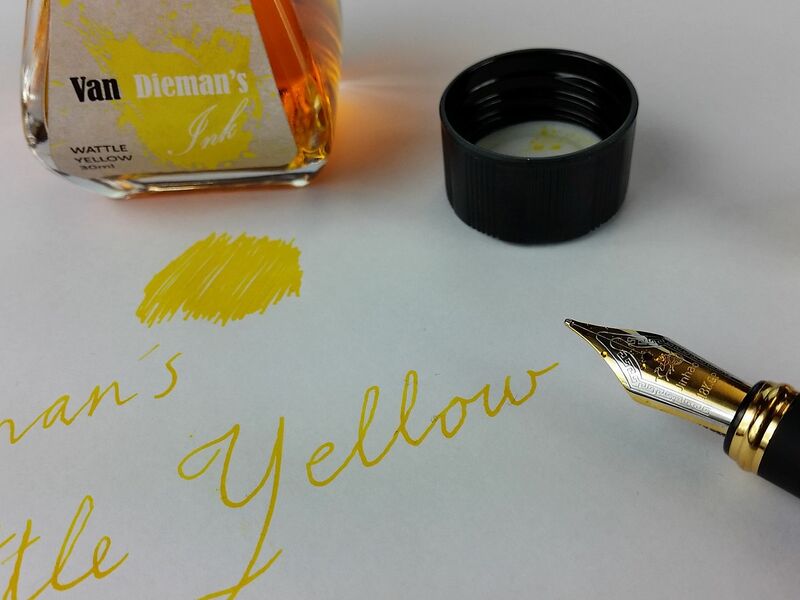 With subtle hints of magenta and mustard yellow, and guaranteed not to clog or clot, you will be very happy with this brightly hued little bottle of radiance. 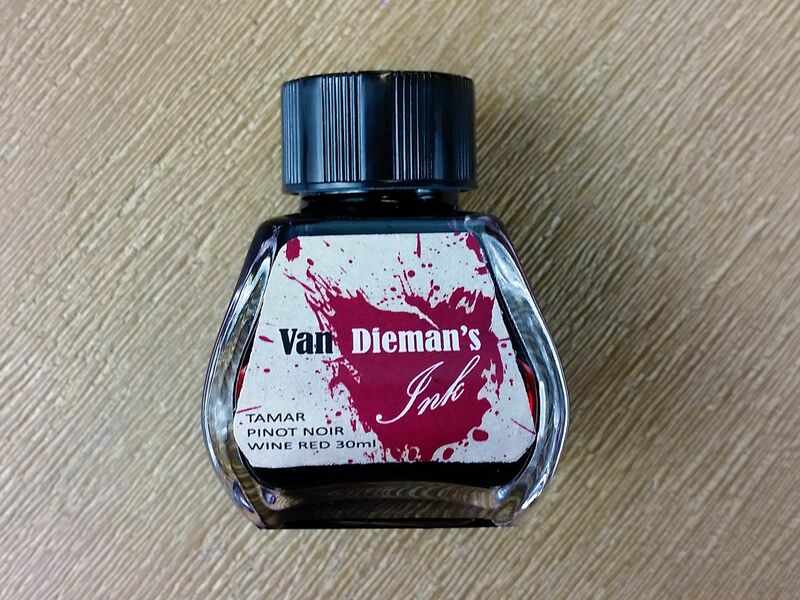 Van Dieman's Pinot Noir Wine Red is a smooth, mellowed ink with flavours of plum and cherry and a touch of an oaky finish. 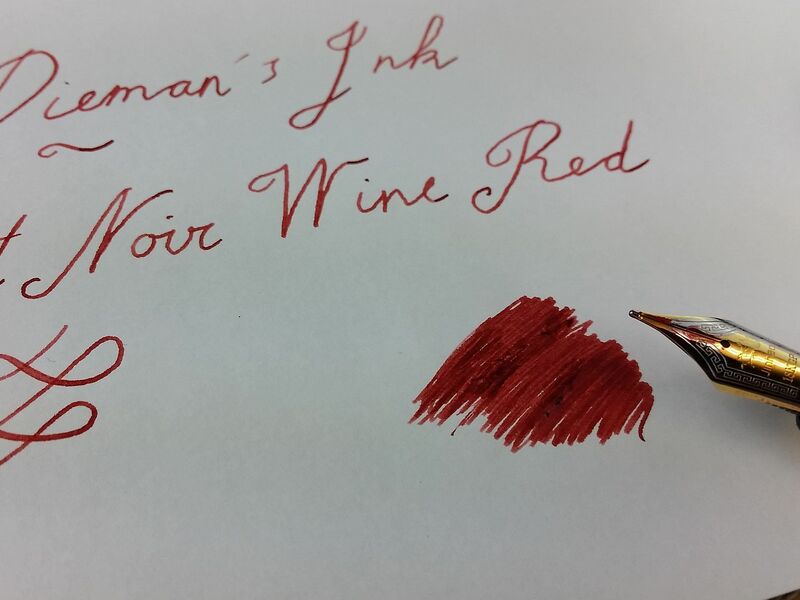 Tasmanian Pinot Noir is renowned for its subtlety and delicate palate, owing to the cool, mild climate of the region and the high quality soil. 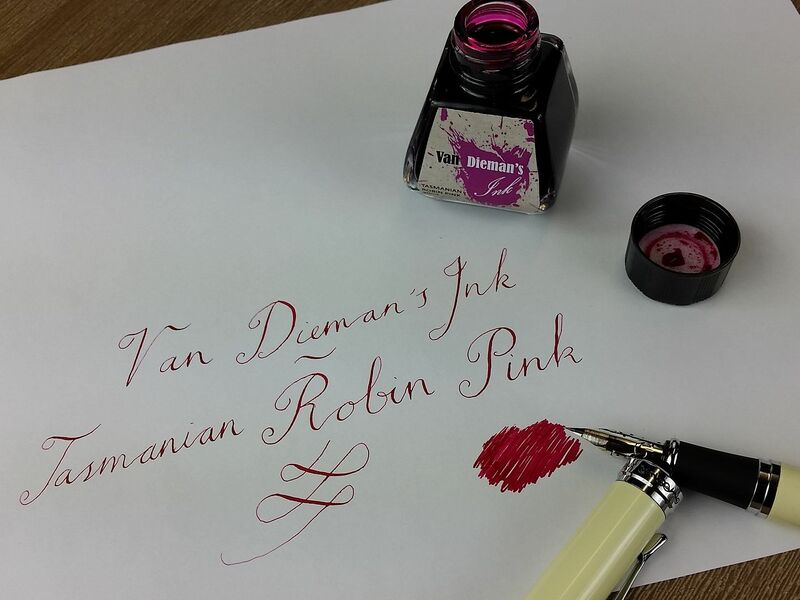 The Tamar region, in particular, has some outstanding examples of this fine varietal. 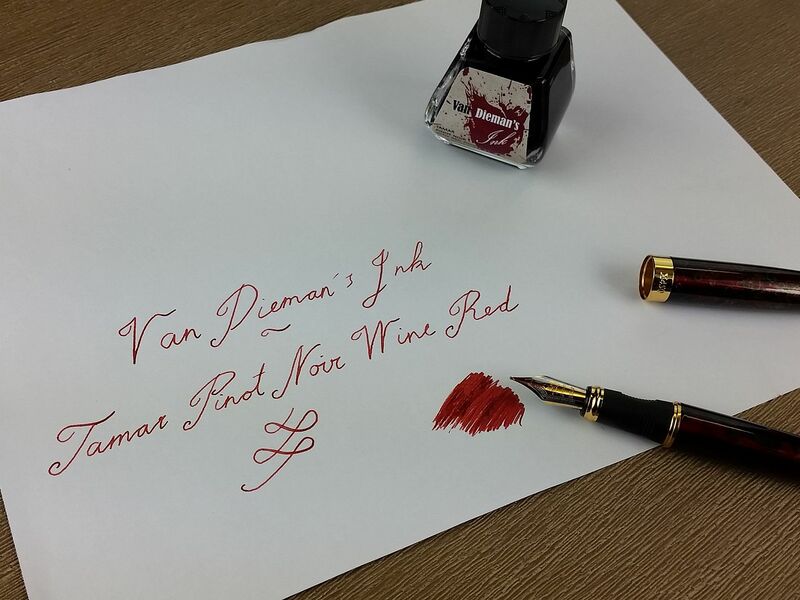 This ink takes its warmer, duskier red hue, with hints of royal blue and chocolate brown, from this pleasing local produce. 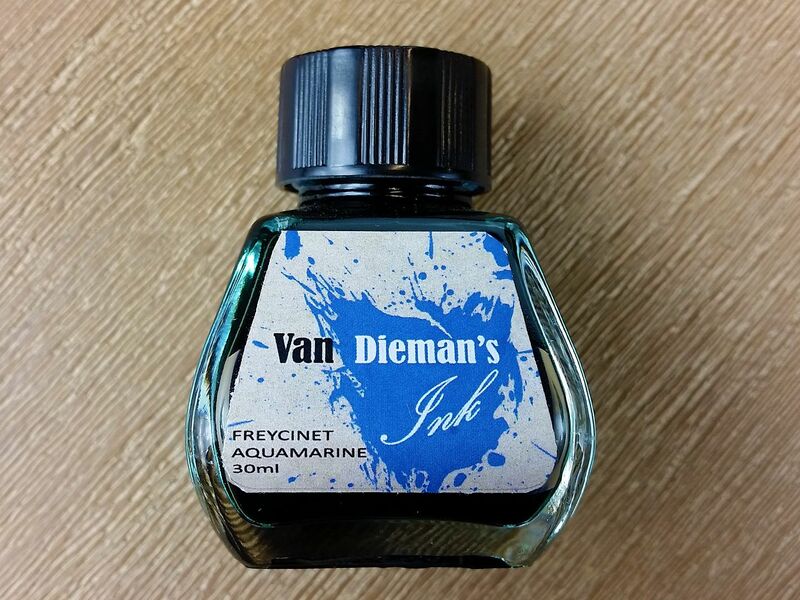 Guaranteed not to clog or clot, you will be very happy with this luscious little bottle of intoxication. 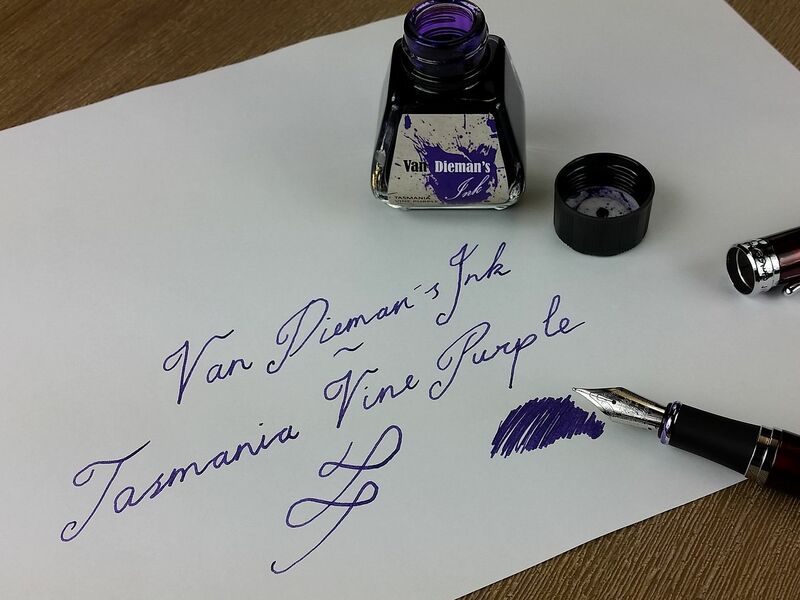 Van Dieman's Tasmania Vine Purple is a deep and sumptuous purple, bordering on violet. 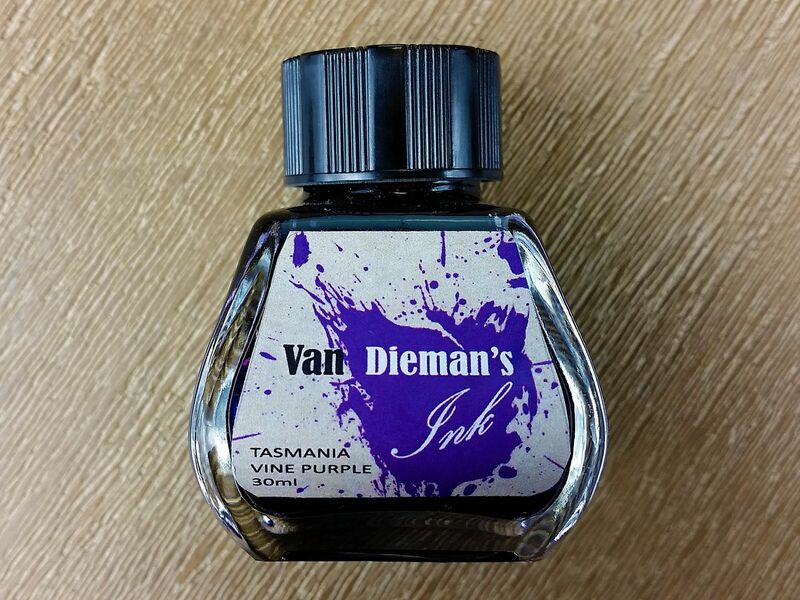 The Tasmania Vine, which bears fruit of the same, deep rich purple hue, gives this ink its colour. 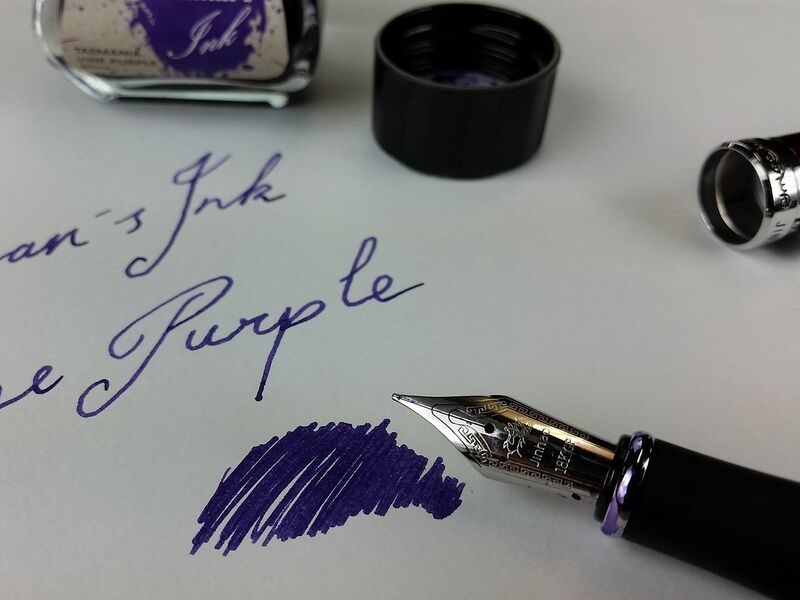 This purple is dark enough to use even as a blue substitute. 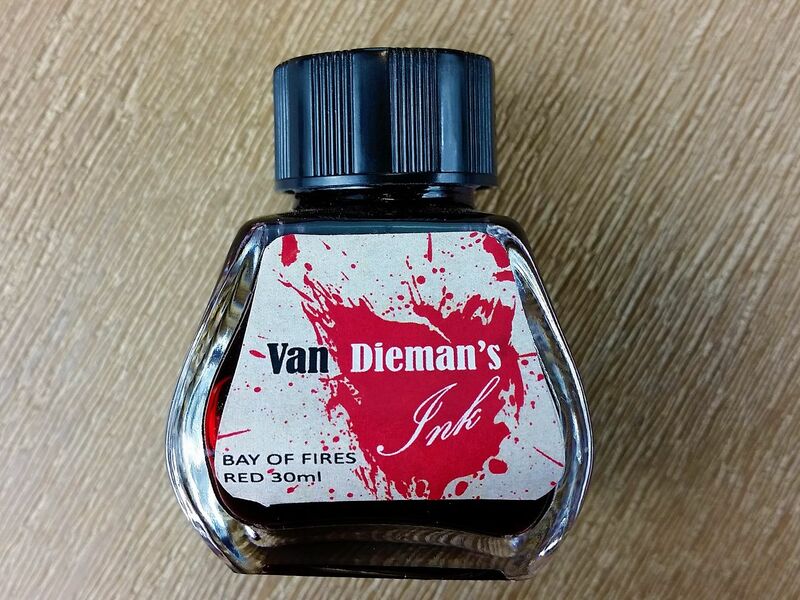 Guaranteed not to clog or clot, you will be very happy with this little bottle of royalty. 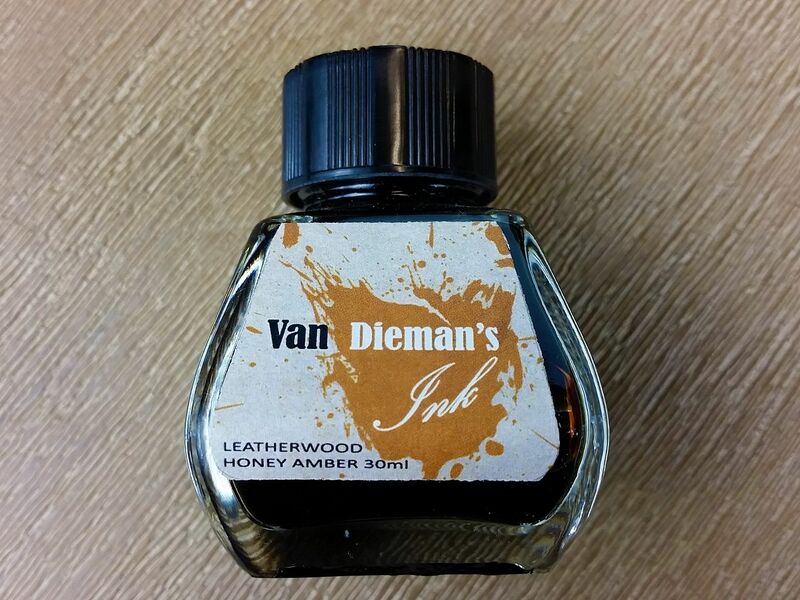 Van Dieman's Oakwood Brown is a warm and nostalgic ink, which reminisces of Tasmania's Victorian heyday and the plethora of deciduous trees planted in her many pleasure gardens. 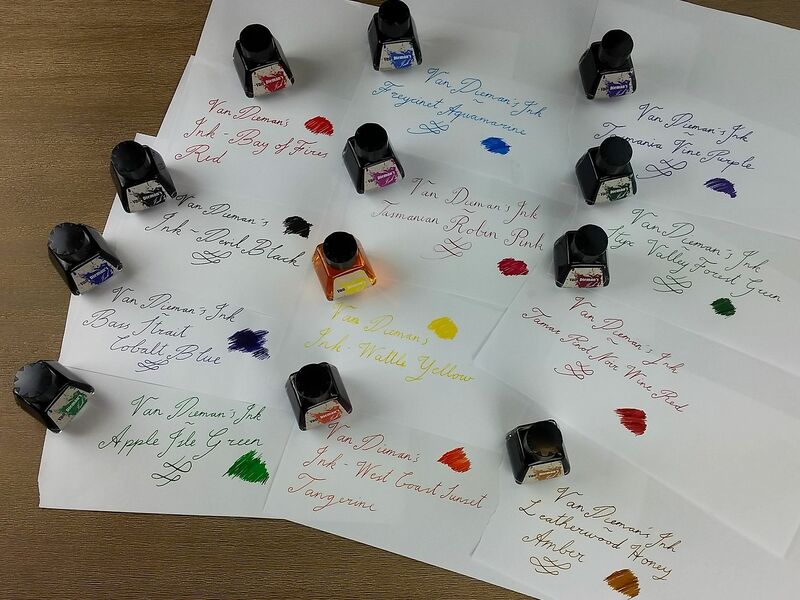 These still decorate the city streets each Autumn with rich reds, golden yellows and luscious browns that make up this hue. 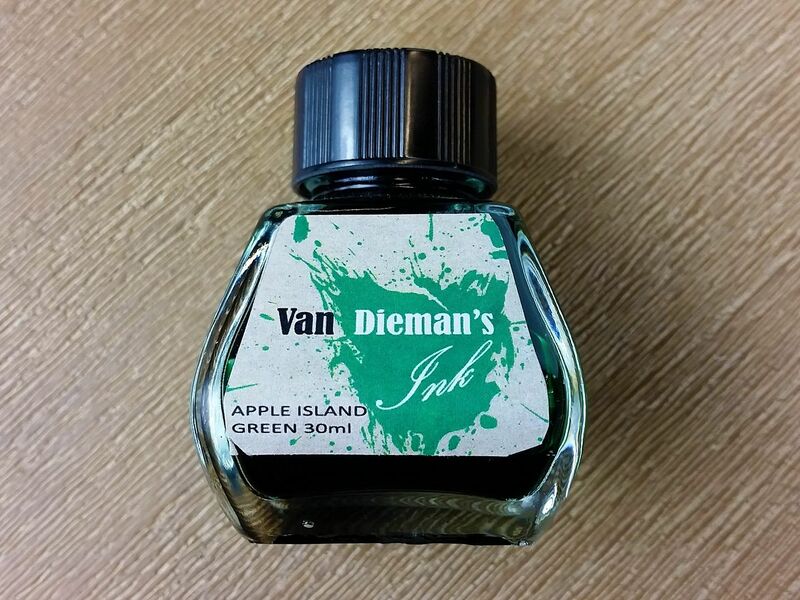 Guaranteed not to clog or clot, you will be very happy with this crunchy little bottle of local produce.